Israel’s Supreme Court has overturned a ban on a US student from entering the country over her alleged support of an anti-Israel boycott campaign. 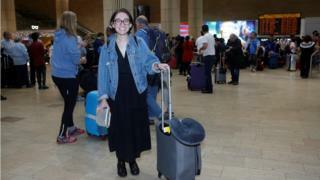 Lara Alqasem travelled from Florida to Tel Aviv on a student visa on 2 October and has since been held at an airport detention centre pending her appeals. Her lawyers called the court’s ruling a victory for free speech, academic freedom and the rule of law. Israeli ministers, however, called the decision “a disgrace” and “shameful”. “The decision to allow the student who openly acts against the state of Israel to stay in country is a disgrace,” said Israel’s Interior Minister Arieh Deri following the Supreme Court decision. The government had argued it had the right to prevent Ms Alqasem from entering based on a controversial 2017 law which bars entry of foreign nationals who support boycotts against Israel over its treatment of the Palestinians. The authorities cited Ms Alqasem’s leadership of a Pro-Palestine university society in Florida, but her lawyers said she was no longer involved in any boycott movements and simply wanted to come to Israel to study. The 22-year-old of Palestinian descent was accepted as a graduate student at the Hebrew University in Jerusalem and obtained a student visa from the Israeli consulate in Miami. When she was barred entry at Ben Gurion airport, Ms Alqasem decided to stay and overturn the decision through legal appeals. Two lower courts had upheld the ban, but the Supreme Court’s three-judge panel said on Thursday that cancelling Ms Alqasem’s visa and deporting her did not serve the fight against international anti-Israel boycotts. It accepted the student’s claim she had ended pro-boycott activity in April 2017 and noted she had since engaged in Holocaust studies. Israel has always insisted that she was not detained or under arrest, and free to return to the US at any time.